After launching Apple FairPlay Streaming service preview for four months, we are pleased to announce the general availability of this service. With FairPlay, you can extend your reach to the newest version of Apple TV by building a FairPlay Streaming solution easily. Combined with existing PlayReady and Widevine DRM support, Azure Media Services provides a single point of control for you to quickly build a multi-DRM solution. Sign up with Apple Development Program. Apple requires the content owner to obtain the deployment package. Please state the request you already implemented KSM (Key Security Module) with Azure Media Services and that you are requesting the final FPS package. Once you obtain the final FPS package, you will need to follow instructions to generate a certification and ASK (Application Secret Key). Please save those which need to be used later when you configuring FairPlay services. Please check out this article if you have difficulties of converting your cert to .pfx format. Upload your certification, password and ASK through the content protection in setting blade. This enable you to apply FairPlay encryption on your assets. Upload a video file and encoded it into H.264 multiple bitrates MP4. Apply encryption on your asset and choose FairPlay with HLS. You could also enable PlayReady and Widevine at the same time. Publish your asset by creating a streaming locator. 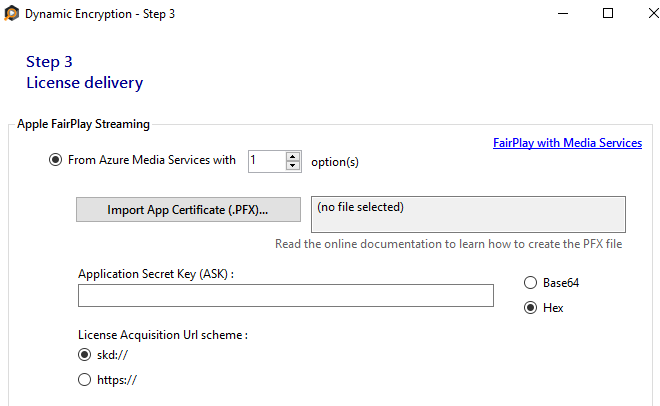 Azure Media Player supports FairPlay encrypted playback. See the player documentation for details on playing back FairPlay encrypted content. Azure Media Services Explorer Tool is a desktop tool that is free to install. 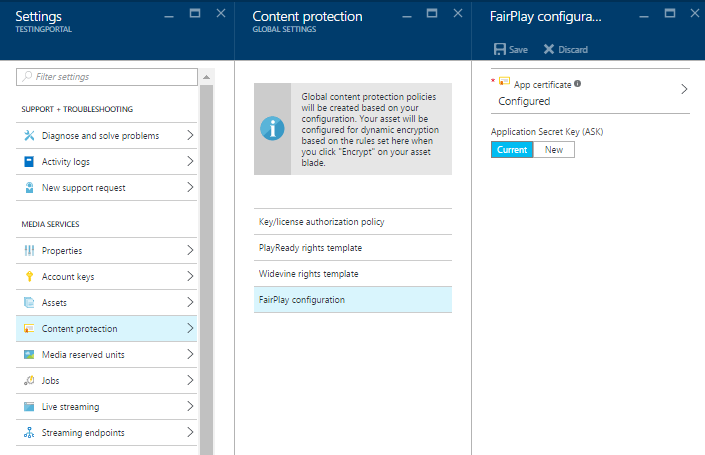 You will find FairPlay configuration by right click on your media services and choose Security –> Add Dynamic encryption and key delivery policies for this asset. FairPlay license delivery services will starting charging at September 1, 2016. We offer 99.9% SLA guarantee for FairPlay license delivery services. Please find pricing details here. FairPlay license delivery services are available in most of Azure Regions, except China and Government Cloud. We are working on adding this services in those regions.